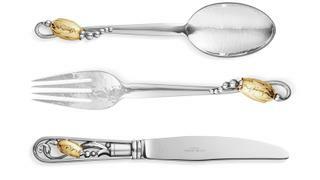 Georg Jensen once again returns to its voluminous archives to launch a “new” collection of ultraluxe flatware. Originally designed in 1919, the sterling silver Blossom set has an 18kt gold-dipped flower bud at each piece’s base, a distinctly art nouveau flourish. with Laboratorio Paravicini. 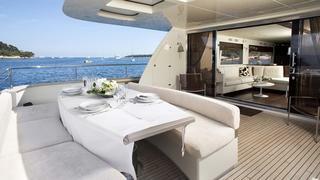 The Firenze design (pictured) is inspired by the colours of its namesake city. 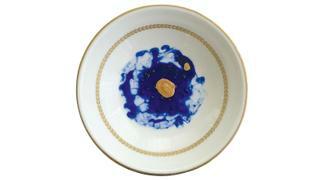 Designer and artist Peter Valcarcel repurposes antique German porcelain for his collection of plates, which features amorphous, languid shapes in gold and royal blue. Each one-of-a-kind, hand painted piece “tells a story of simplicity and purity only found in nature,” he says. Moleria Locchi has been carving crystal in Oltrarno, Florence, since the 19th century. 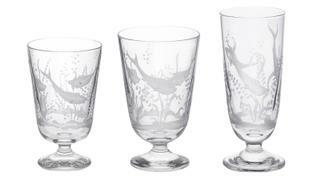 This set of three Ejermann glasses has a finely wrought and whimsically rendered underwater scene. Designed in a spirit of optimism and peace, Josef Frank created the Knot of Friendship candelabrum in 1938, just before the onset of World War II. 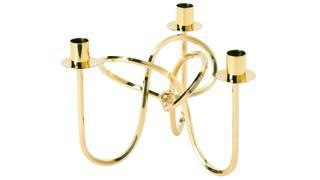 The interconnected, lyrical design in warm brass remains an iconic design.